Scroll down to see the top not-for-profit colleges and universities in Pennsylvania offering online degree programs. Drexel University has more than 140 online programs that lead to a bachelor's or master's degree or certificate. Subject areas include arts administration; business, including online MBA programs in an accelerated or flex format; clinical research; communications; construction management; engineering and computer science; general studies; information management; information science/systems; project management; property management; and technology. Additionally, educators can choose from dozens of certificate and master's programs, and students in the nursing or health professions have dozens of options for certifications, master's and doctoral degrees through Drexel's online programs. Drexel's online classes are offered on the quarter schedule with four terms per year. Online students may be eligible for financial aid. Drexel also offers reduced tuition rates for online students who are alumni; active duty military, veterans, or their families; and students who are affiliated with more than 500 partner organizations, including corporations, school districts and professional associations around the United States. Online students have access to 24/7 technical support as well as to the library, writing center, and career services. Before students sign up for an online class, Drexel invites them to take a 'test drive' where they learn how to use important features of the online classroom. California University of Pennsylvania offers a range of completely online degrees, from the associate to doctorate level. The university recently began offering associate degrees in liberal studies and technical studies, and both programs offer a degree completion option if a student decides to earn a bachelor's degree. Ten bachelor's degrees are available online, including Arabic language and culture, homeland and international security, land management, legal studies, and wellness and fitness. The newest options are computer information systems and liberal studies. California University recently began offering a Doctor of Health Science in Health Science and Exercise Leadership as an online program. Students seeking a Master of Science in Exercise Science and Health Promotions can choose from 14 options. Master of Education candidates have nine options, and M.S. in Legal Studies candidates have three options. The university recently added a dual master's degree program in nursing and business administration to its online offerings. All online classes are offered in an asynchronous format that allows students to view class materials whenever they wish with no requirement to come to campus. California University offers a tuition discount to active duty military and their dependents who enroll in an online program. Harrisburg Area Community College is the oldest community college in Pennsylvania, and it has been offering online classes since the early 2000s. About 30 associate degrees are available completely online, along with four diploma programs and 10 certificate programs. A dozen of the online degrees are for students who plan to transfer to a four-year college, and HACC has transfer agreements with more than 60 colleges. The rest of the online associate programs are career degrees in fields such as technology, health science, and business. The newest online degree is an Associate in Applied Science in Wellness and Health Promotion, and students select a focus in either workplace wellness or community health. The Community College of Allegheny County has 14 degrees that can be earned entirely online and another 27 programs where 50 to 99 percent of the coursework is available online. Students seeking a job-focused certificate or diploma program have almost as much choice, with 13 totally online programs and 10 certificates that are at least 50 percent online. The online programs cover subject areas such as business, education, and technology. CCAC also has accelerated professional programs that combine online learning with some in-person classes. Students who are using CCAC as a stepping stone to a university can easily transfer credits to nearly 30 colleges and universities the college has agreements with. Saint Joseph's University offers a Bachelor of Science in Professional and Liberal Studies as well as a Bachelor of Science in Professional and Liberal Studies: Concentration in Autism Studies to online students. The school also offers seven graduate degrees: a Master's in Business Intelligence, a Master's in Organization Development and Leadership, a Master's in Criminal Justice, a Master's in Instructional Technology, a Master's in Secondary Education, a Master's in Special Education, and a Master's in Health Administration. Additionally, five graduate certifications can be earned online: Instructional Technology Specialist Certification, Online Accelerated Teacher Certification (OATCERT), Special Education Certification, Online Wilson Reading System Certification, and Behavior Analysis Certification. Saint Joseph's has several options for online start dates with sessions beginning in August, October, January, March. Online students may be eligible for the same scholarships and financial aid that is available to on-campus students. Students who have completed a minimum of 12 hours of coursework at another institution are able to transfer into the undergraduate degree, and SJU partners with several community colleges to make it easier for students to obtain an associate's degree before finishing a bachelor's. Students pursuing online graduate degrees can transfer up to two courses from another institution. Wilkes University offers 11 Master's degrees entirely online including an M.S. in 21st Century Teaching and Learning, an M.S. in Art and Science of Teaching, an M.S. in Classroom Technology, an M.S. in Educational Leadership, an M.S. in Effective Teaching, an M.S. in Instructional Media, an M.S. in Instructional Technology, an M.S. in International School Leadership, an M.S. in Middle Level Education with Grades 4 to 8 Certification, an Online Teaching M.S. with Online Instruction Endorsement, and an M.S. in School Business Leadership. Students may transfer a maximum of six credits into these programs if the credits meet specific qualifications. Classes begin in January, May, June, August, and December, and typically online students will not need to be online at specific times. There are still, however, deadlines and exam dates, and some courses may require proctored exams. Online students may apply for the same financial aid on-campus students receive. Montgomery County Community College's Virtual Campus is home to its online degrees and certificate programs. The college offers about three dozen programs through the Virtual Campus, with roughly half of these programs available 100 percent online. The majority of online programs are in the field of business, including a transfer associate degree, a career associate degree, and about a dozen certificates. Transfer degrees in liberal studies and secondary education are also 100 percent online. Some online programs at MCCC require proctored tests. Montgomery County Community College is an Achieving the Dream Leader College and has been honored for its efforts to help students succeed, including creating new approaches to teaching math and adding support services for students. The Community College of Philadelphia has six programs that can be earned entirely through online classes, and these are all programs designed for students who plan to transfer to a four-year school. Options include accounting, psychology, and justice. CC of Philadelphia has transfer agreements with many colleges and universities to make it easy for associate degree graduates to transfer into a bachelor's program. These schools include St. Joseph's University, La Salle University, and Temple University, depending upon the degree obtained. Most online courses are asynchronous, although a few may require a proctored exam or a scheduled live session. Villanova University offers four bachelor's degrees online including a Bachelor of Arts in Public Service & Administration, a Bachelor of Arts in Media and Technology, a Bachelor of Arts in Leadership Studies and the new Bachelor of Interdisciplinary Studies in General Studies. For those seeking a Bachelor of Science in Nursing, the school provides a unique RN to BSN program, designed especially for registered nurses. To be accepted into this program, students must have a minimum of 60 transfer credits from a prior nursing program. Villanova also offers two graduate degrees: a Master of Public Administration and a Master of Science in Human Resources Development. Villanova University also offers fourteen master certificate programs (Agile Management, Project Management, Six Sigma, Business Process Management, Business and Law of Sports, Contract Management, IS Security, Business Analysis, Software Testing, IT Service Management, Business Intelligence, Human Resources, ROI Methodology, and Organizational Leadership). Financial aid is available for all students including Federal Pell Grants, State Grants, and William D. Ford Federal Direct Loans. There are two fall sessions (one beginning in August, the other beginning in October) and two spring sessions (one beginning in January, the other beginning in March) for students to take advantage of. Northampton Community College's mission to provide an accessible education is reflected in the college's commitment to online education. Each semester, the college provides more than 160 online courses, with multiple sections available for many of them. In fact, all five of the most popular degrees can be completed entirely online, including business administration, criminal justice, and early childhood education. In total, the college has 10 online degrees and three more that only require one or two classes on campus. Classes follow a traditional academic calendar and have regular due dates for assignments. Some classes may require proctored tests, and online students who live nearby can use the campus testing center for proctoring services. Clarion University of Pennsylvania offers a wide range of degrees that can be earned entirely online, from associate degrees to a Doctor of Nursing Practice. Associate degree programs include arts and sciences, allied health, business administration, criminal justice, and early childhood education. Undergrads can choose from six concentration areas in liberal studies, or they can seek a bachelor's degree in sociology and psychology, business administration, allied health leadership, medical imaging, technology leadership, criminal justice administration, English, or a nursing degree completion program. Master's degrees include education, mass media arts and journalism, applied data analytics, accounting, rehabilitative sciences, library science, and business administration. The Master of Science in Nursing requires students to attend labs and clinicals onsite. Online classes are delivered mostly in a traditional semester format, although four master's programs and the RN to B.S.N. program also give students the option of taking seven-week classes which run for the first or second half of a semester. Online students are eligible for financial aid and scholarships. Clarion has two scholarships exclusively for online students; one is for master's students in mass media arts and the other for students seeking a B.S. in Liberal Studies. Delaware County Community College has been offering online and hybrid classes since 1998, when the internet was just a baby. Currently the college offers more than 130 online courses and has three degrees students can earn entirely online. Those degrees are Associate in Arts in Global Studies or in Liberal Arts, or Associate in Science in Business Administration-General Business. However, another five associate degrees are about 90 percent available online, including sociology, English, and education. Four certificate programs are offered online. An additional option is a hybrid degree, which includes online and in-class work. Eight hybrid degrees are available with between 70 and 85 percent of the work online. Students who wish to pursue their M.A. in Criminal Justice or History may do so online at SRU. In addition, the university offers the following graduate programs in Elementary Education online: K-8 Math & Science (M.Ed. ), K-12 Reading Specialist (M.Ed.) and K-12 Reading Specialist with Instructional Coaching Literacy Endorsement (M.Ed.). There are also three online Secondary Education graduate programs available (all are Advanced Track): Teaching Mathematics and Science (M.Ed. ), Teaching English (M.Ed.) and Teaching History (M.Ed.). SRU has five online Special Education graduate programs, including one doctoral program: Autism (M.Ed. ), Grades 7 to 12 (M.Ed. ), Birth to Grade 8 (M.Ed. ), Supervision (M.Ed.) and Educational Doctorate (Ed.D.). Students can also earn an online graduate degree (M.Ed.) in Technology for Online Instruction. The graduate education programs at Edinboro University were listed among the Best Online Programs in the 2017 U.S. News and World Report college rankings. Edinboro offers a wide variety of graduate degrees at that can be completed online, including the first online accredited Master of Arts in Counseling - Art Therapy degree. This program prepares students for licensure as a counselor and registration as an art therapist. Many of the online programs are designed for teachers, including master's degrees and endorsements. Nurses can earn a master's degree or Doctor of Nursing Practice online. Edinboro does deliver some undergraduate classes in an online format but its bachelor's degrees are not considered online degrees. Students seeking an online degree can complete one of 19 associate degrees or three certificates through Bucks Online, the online learning program offered through Bucks County Community College. Students can earn associate degrees in subjects as varied as mathematics, English, and psychology completely through online courses. For the degrees in management and marketing, students take all classes online and complete an internship. People willing to spend some time on campus can choose from another 20 or so programs where at least 80 percent of coursework is available either online or through hybrid classes that combine online work with face-to-face class sessions. Westmoreland County Community College runs over 30 fully online associate degree and certificate options, nearly half of which are concentrated in business and accounting, meaning students can get super specialized. While even the medical certificates have a business slant, an assortment of criminal justice programs and a sprinkling of basic computer certificates diversify the slate. Different programs are available via blended learning, including nearly a dozen computer degrees and certificates as well as some management credentials. The online Bachelor of Business Administration (BBA) degree offered by the Fox School of Business at Temple University is ranked as the #6 online BBA program in the country by U.S. News & World Report (2016). Three majors are available - accounting, business management, and human resources. Courses are delivered synchronously and students pay in-state tuition. The school's online Master of Business Administration (MBA) program is currently ranked as the top online MBA program in the country (U.S. News & World Report, 2016). Students begin the program with a week-long residency on campus. After this, courses are available asynchronously 24/7 with a few pre-scheduled synchronous sessions throughout the program. Master of Science degrees are offered in four areas: communication management, digital marketing, human resource management, and quality assurance and regulatory affairs. Temple currently offers doctoral degrees in athletic training, occupational therapy, and physical therapy. Several online certificate programs are available online as well, including a Health Informatics Certificate and a Certificate in Digital Education Leadership. The School of Pharmacy offers online certificates in the following five fields: drug development, basic pharmaceutical development, clinical trial management, global pharmacovigilance (benefit risk assessment), and GMP (Good Manufacturing Practice) for the 21st century. The University of Scranton offers the following degree programs online: Master of Accountancy (MAcc), Master of Business Administration (MBA), Master of Science (MS) in Education, Master of Health Administration (MHA), MS in Health Informatics, and MS in Human Resources. The 30-credit MAcc program offered by the university's Kania School of Management is open to applicants with or without an accounting background. Those without an accounting background may be required to enroll in pre-requisite courses in order to gain the needed foundational knowledge to complete the program. The MHA program offered at the university is a fully-online program and accredited by the Commission on Accreditation of Healthcare Management Education (CAHME). Two graduate certificates - in Enterprise Resource Planning (ERP) and in Supply Chain Management (SCM) - are currently available online. The ERP certificate consists of four courses (each course runs for eight weeks) and offered conjointly with SAP, the world's largest provider of ERP software. Applicants must have a GPA of at least 3.0 from an accredited university to be considered for the program, which can be completed in just one year Credits earned from completing the ERP or SCM programs can be applied towards an MBA degree at the university. Lehigh Carbon Community College offers online courses in a 15-week format or in an accelerated 10-week format in the spring and fall semesters. In the summer, courses run for 10 or five weeks. And between fall and spring semester, students can complete one online course in just a few weeks, completing credits for required classes such as U.S. history or an introductory social science class. The college offers 10 degree programs entirely online, including transfer degrees and more job-focused Associate of Applied Science degrees. Classes for a dozen career-focused certificates and diplomas are also delivered online. A few additional degrees can be earned online aside from one or two science classes where students must come to campus for labs. Robert Morris University (RMU) offers a vast array of undergraduate and graduate degrees as well as certificate programs that can be completed entirely online. Bachelor of Science (BS) degrees are available in business administration, cyber forensics & information security, health services administration, nursing, and organizational leadership. There are two Bachelor of Arts (BA) degrees available - BA in Criminal Justice and BA in Psychology. Students accepted to the BS in Business Administration program can choose to concentrate in one of two fields - hospitality and tourism management or human resource management. The undergraduate degree in nursing is an RN to BSN program. There is also a fully online RN to MSN degree. Both programs are CCNE-accredited. Online Master of Science degrees are available in a wide range of disciplines, including (but not limited to) the following: organizational leadership, engineering management, data analytic systems, information technology project management, and business education. The university offers an online Master of Business Administration (MBA) degree that allows students to customize their degree by enrolling in elective courses that support their career goals. There are currently two fully online doctoral programs - Doctor of Nursing Practice (DNP) and Doctor of Philosophy (PhD) in Instructional Management and Leadership. Duquesne University offers several fully-online degrees across different disciplines that include business, education, liberal arts, and nursing. Two online Master of Science (MS) programs are available from the university's Palumbo Donahue School of Business - MS in Management and MS in Sports Business. In the field of education, the university offers an MS in Instructional Technology degree and a Doctor of Education (Ed.D.) in Instructional Technology and Leadership program. There is also an Instructional Technology Specialist Certificate available online. The Center for Adult Learners gives non-traditional students the option of completing the following Bachelor of Science (BS) degrees online: BS in Behavioral Science, BS in Computer Systems Technology, and BS in Organizational Leadership. There are two additional online programs currently available - Master of Science in Leadership (McAnulty College and Graduate School of Liberal Arts) and Master of Arts in Corporate Communications (Communication and Rhetorical Studies Graduate Department). The School of Nursing offers an online RN-BSN program, as well as a Master of Science in Nursing (MSN) degree with three areas of specialization: family nurse practitioner, forensic nursing, and nursing education. There are two doctoral nursing degrees that can be pursued online - Doctor of Philosophy in Nursing and Doctor of Nursing Practice. Pierce University specializes in teaching adult learners, and it has many programs designed to help adult students finish work toward their degree as quickly as possible. In addition to offering many online degree programs with six terms of accelerated eight-week classes per year, the college also offers some intensive courses where content is compressed into a three-week session. These intensive courses are offered online during regular sessions and also in a limited winter session during the traditional holiday break. Pierce also offers a competency-based-education program for students seeking a bachelor's degree in information technology with a concentration in networking, administration and information security. These online classes are self-paced and focus on the skills a student still needs to learn. Students in the competency-based program can earn credit for industry certifications and previous college coursework. Pierce University also offers traditional online degree programs in accounting, criminal justice studies, health care administration, human resource management, organizational leadership and management, business administration, integrated leadership, and health information administration. Online students have access to support services such as advising, academic workshops, an online bookstore and library, and tutoring. Luzerne County Community College has 11 programs that can be completed almost entirely online. Luzerne considers any program with at least 80 percent online content to be an online program, so some of these programs may include hybrid classes or otherwise require students to come to campus. Four Associate of Science degrees are available for students who want to transfer to a four-year school. The Associate of Applied Science, a more career-focused degree, is available for seven majors in fields related to business, technology, and criminal justice. To make sure students are cut out for online learning, Luzerne provides a self-assessment test and demo class for students to test the waters. La Salle University offers a variety of 100 percent online programs, which range from undergraduate degree-completion programs to full master's programs. Coursework for the online master's degrees combines both synchronous and asynchronous elements. Classes are presented in eight-week terms, and students take one class at a time, completing two classes in a traditional semester. Online classes are offered in the spring, summer, and fall. Online graduate degrees are offered in analytics, computer information science, cybersecurity, economic crime forensics, human capital development, information technology management, instructional technology management, and nonprofit leadership. Online graduate certificates are available in cybersecurity, fraud and forensic accounting, human capital development, and instructional technology management. Adults who are returning to school and who have an associate degree can apply for the 100 percent online degree program leading to a Bachelor of Arts in Organizational Leadership. Working nurses can finish their Bachelor of Science in Nursing online. La Salle also has a 10-course online program designed for students who need prerequisite courses before entering a master's program in speech pathology. West Chester University offers a variety of fully online programs for students who are interested in an advanced degree in fields such as business, nursing, or education. Along with master's degrees and doctoral degrees, West Chester also offers career-oriented graduate certificates for online students. All online coursework is offered in an asynchronous format, allowing students to access class material at the time that best suits their schedule. Online students have access to technical help as well as the standard services on-campus students have access to, such as academic advising. Online master's programs include MBA, Master of Public Administration, Master of Education in Special Education, Master of Education in Early Childhood Education, and Master of Science in Community Nutrition. Doctoral programs include Doctor of Public Administration and Doctor of Nursing Practice. Students interested in advancing their career without completing all the work required for a graduate degree can complete an online certificate program. Options include Graduate Certificate in Adapted Physical Education, Education Technology Certificate, Post-Baccalaureate Teacher Certification in Special Education, Certificate in Universal Design for Learning and Assistive Technologies, Graduate Health Care Management Certificate, Graduate Certificate in Geographic Information Systems, and Graduate Certificate in Gerontology. The School of Education at the University of Pittsburgh offers the following Master of Education (M.Ed.) degrees online: M.Ed. in Elementary Education, M.Ed. in English and Communications, M.Ed. in Mathematics Education, and M.Ed. in Secondary Social Studies Education. Nurses who have completed their BSN degrees can explore the Master of Science in Nursing (MSN) program that the university offers online. The MSN degree has three areas of specialization: clinical nurse leader, nursing informatics, and nursing administration. There is also an online Doctor of Nursing Practice degree available, in addition to two certificate programs - Certificate in Nursing Research and a Post-MSN/DNP Nursing Informatics Certificate. The online Master of Library and Information Science degree is comprised of 12 courses (36 credits) and designed to be completed within two years of part-time study. Students who earn the Certificate of Advanced Study in Security Assured Information Systems will be eligible for CNSS (Committee on National Security Systems) certification. Online degree programs are also offered by the following schools: School of Law (Healthcare Compliance Certificate), the Graduate School of Public and International Affairs (Master of Public Policy & Management), and the University Center for Social & Urban Research (Graduate Certificate in Gerontology). DeSales University offers about a dozen online degree programs that are designed for adult learners. Applicants to these programs must have a high school diploma or GED, but most of the programs do not require prior college experience. Students who have attended college may transfer up to 75 credits, and the college also grants credit for prior learning, such as work experience or military training. Prior learning is assessed through tools such as placement exams and portfolio assessments. Bachelor's degrees are available in business administration, accounting, criminal justice, finance (including an optional track in financial planning), human resource management, management, marketing, psychology, supply chain management, and theology. Nurses with an associate degree or diploma can complete work for a Bachelor of Science in Nursing through online coursework at DeSales. The university offers 11 session start dates a year. Most classes are delivered in six- or eight-week sessions, but the college also has a three-week "wintermester" during the time colleges typically schedule winter break. The Center for Adult and Continuing Education at Misericordia University offers undergraduate, graduate, and certificate programs that can be pursued predominantly online. Students accepted to the Bachelor of Science (BS) in Business Administration program can choose from the following areas of specialization: management, marketing, management information systems, health care management, and sport management. BS degrees are also offered online in accounting, applied behavioral sciences, diagnostic medical sonography, healthcare management, IT, and nursing. A Bachelor of Arts (BA) in Government, Law and National Security degree is also available online. Applicants with previous university or college credits can complete an online BS or BA degree in professional studies. On the graduate level, the university offers an online Master of Business Administration (MBA) degree with the same areas of specialization as the BS in Business Administration program. Students can pursue Master of Science (MS) degrees in health informatics, nursing, education, organizational management, and occupational therapy. At the current time, there are three doctoral programs that can be pursued partially online in the fields of nursing, occupational therapy, and physical therapy. Monmouth University offers online graduate certificate programs in the following areas of study: autism spectrum disorders, geriatric care, health informatics, family nurse practitioner, and pediatrics. Students accepted to the online Master of Business Administration (MBA) program at Widener University can choose to follow a general MBA curriculum or concentrate in one of two areas - business process innovation or healthcare management. Online courses for this degree are offered in an accelerated seven-week format. Widener offers an online RN to BSN degree that can be completed in just one calendar year for students who enter the program with a minimum of 59 pre-requisite credits. Alternately, students can create an individualized learning plan and enroll in only one course per semester, completing the program at a pace that allows them to stay employed full time. The university currently offers three fully-online Master of Education (M.Ed.) degrees - M.Ed. in Allied Health Education, M.Ed. in Educational Foundations, and M.Ed. in Instructional Technology. Students can complete the online Master of Social Work degree in just three semesters if they follow a full-time plan of study. Widener University's Center for Continuing Studies offers non-traditional students several online degree options in different fields: allied health (AS and BS), general studies (AS), liberal studies (AA and BA), organizational development and leadership (BA), professional and applied studies (AS and BS), and radiologic technology (AS). There are currently three online degree completion programs offered at Chatham University: Bachelor of Arts (BA) in Business Administration, BA in Psychology, and BA in Healthcare and Business Management. An RN to BSN degree is available online as well. Students accepted to any of these programs can transfer up to 90 college credits from an accredited school or program. The online MBA program allows students to earn a maximum of 20 percent of their coursework through transfer credits or Prior Learning Assessment (PLA). Students can earn PLA credits by creating a portfolio or passing a challenge exam. There is a fully-online, 30-credit Master of Professional Writing (MPW) program that offers concentrations in technical writing and in web content development. The program has developed pathways for two types of students - nonprofit professionals and communications professionals. Additional degree programs that can be earned entirely online include the following: MS in Interior Architecture, MS in Healthcare Informatics, and MS in Nursing. The university also offers low-residency programs that offer mostly online courses with one or two on-campus requirements. These include the Master of Fine Arts (MFA) in Creative Writing, the Professional Doctor of Occupational Therapy, and the Doctor of Nursing Practice (DNP) programs. Carlow University offers a variety of online degree and certificate programs, mostly at the master's degree level. The online MBA program offers five concentrations: fraud and forensics, health care management, leadership and management, project management, or human resource management. A fully online Master of Science in Fraud and Forensics is also available. Educators can earn a Master of Science in Education with certification in special education at the PreK-8 or Grades 7-12 level or a Master of Science in Educational Leadership for High Performance Learning. Nurses can earn a Master of Science in Nursing with a concentration in education and leadership or enter an entirely online dual degree program leading to an MSN and MBA. Nurses with an associate degree or diploma can finish their bachelor's degree in an all-online program. Carlow also offers two programs that combine online work with low residency requirements. The Doctor of Nursing Practice program includes synchronous elements on two Saturdays each semester, with the rest of the coursework online. The Master of Fine Arts in Creative Writing requires students to attend two intensive, 11-day residencies, one held in January in Pittsburgh, Pennsylvania, and the second held in June in Dublin, Ireland. Indiana University of Pennsylvania offers four master's degree in an online format and some graduate degrees in a hybrid format. Additionally, a wide variety of graduate and undergraduate courses in many subjects are offered online, but students would not be able to complete all degree requirements online. One of the online degrees is a Master of Arts in Adult and Community Education, which students can complete in two years by taking two classes per semester, including summers. The program uses a cohort model. The online program leading to a Master of Arts in Criminology is designed for part-time students, who take two courses each fall and spring and two five-week courses over the summer. The Master of Science in Food and Nutrition is IUP's newest online option and gives students the choice of an administration track or education track. Classes for the Master of Arts in Art are offered online in the fall and winter and on campus in the summer. This is a 30-credit, practice-oriented program. The Master of Science in Safety Sciences has a hybrid format that includes online coursework with one-week, on-campus summer courses. Saint Francis University offers three online master's programs and two online bachelor's degree-completion programs. The Master of Health Science is designed for working professionals who want to take a leadership role in the health care sector. Candidates in the program can select from tracks in clinical, health education, or health leadership, or they can create a course of study that incorporates courses from all the tracks. The Master of Medical Science program gives participates in six physician assistant certification programs a chance to earn a master's degree while they are completing their required clinical rotations. The Master of Human Resource Management allows students to complete an optional internship. The two bachelor's completion programs are open to students who have some undergraduate credits to transfer in, such as credits from an associate degree. Students may also be able to transfer military credits. The degrees offered are Bachelor of Science in Health Studies and Bachelor of Science in Behavioral Science. Online classes are mostly delivered in an asynchronous format. Eastern University's online programs focus on adult graduate and undergraduate students who are interested in the fields of education, nursing, and business. The School of Management Studies offers two 100 percent online MBA programs, the Fast-Track MBA in Management and the Fast-Track MBA in Health Administration. Undergrads who are interested in management can earn an online Bachelor in Organizational Leadership or Bachelor of Science in Business Administration, which has a competency-based approach. The Department of Nursing has an online RN to BSN program for working nurses who want to complete a Bachelor of Science in Nursing. Nurses with a BSN and Pennsylvania licensure are eligible for the department's online program leading to certification as a school nurse for grades K-12. The Loeb School of Education offers one online degree, Master of Education in TESOL, and delivers online coursework required for several teacher endorsements in Pennsylvania, including early childhood director, autism, and instructional coach. Adults who are just beginning their college career can earn an Associate of Arts in Liberal Arts, which allows them to take electives in business and communication subjects. Online courses are delivered in a six-week format. The online courses offered at Lehigh University follow one of two formats: Classroom LIVE, which allows students to interact with their professors and peers in real time, or Classroom Online, which delivers asynchronous courses for students to access at any time and from anywhere. The university's Department of Chemical and Biomolecular Engineering offers online Master of Engineering (MEng) degrees in three areas: biological chemical engineering, chemical energy engineering, and chemical engineering. Students interested in the fields of management science and engineering or in manufacturing systems engineering have the option of pursuing an MEng or a Master of Science (MS) degree in either discipline. The P.C. Rossin College of Engineering offers an online Master of Mechanical Engineering degree that requires 30 credit-hours and has both thesis and non-thesis options. A number of 12-credit certificate programs are available online in areas such as the bio-organic principles of pharmaceutical science and regulatory affairs in a technical environment. The College of Education offers several graduate and certificate programs with both online and face-to-face components. Some of these include the following: International Counseling Certificate, Master of Education (M.Ed.) in Educational Leadership & Principal Certification, and Doctor of Philosophy (PhD) in Comparative and International Education. Three fully-online Bachelor of Science (BS) degrees are currently available from Alvernia University: BS in Business Management, BS in Healthcare Administration, and BS in Healthcare Science. Students with an associate degree, or 70 or more transferrable credits, will still be required to complete at least 30 Liberal Arts core credits at the university. Bachelor of Arts (BA) degrees in behavioral health and in criminal justice are also available online. The RN to BSN completion degree offered online at Alvernia University is designed for graduates of an associate nursing or diploma program, as well as individuals who plan to sit for the NCLEX-RN exam. Alvernia's RN to BSN program is accredited by the Commission on Collegiate Nursing Education (CCNE). On the graduate level, Alvernia offers an online Master of Business Administration (MBA) degree that is comprised of 30 credits and can be completed in just one year. Students must enroll in a capstone course in order to graduate from the program. There is currently one doctoral degree available online, which is the 35-credit Post-Master's Doctor of Nursing Practice (DNP) Clinical Leadership degree. The completion of a practicum component is required for the degree, can be completed a student's home community. There are currently eight online Bachelor of Science (BS) degrees available at Philadelphia University. Each degree is comprised of 120 credits and can be completed in two to three years. The completion time depends on the number of transferrable credits students are allowed to apply towards the degree of their choice. BS degrees are available in the following disciplines: accounting, behavioral and health services, business management, health services management, human resource management, information technology management, law enforcement leadership, organizational leadership, and professional communications and emerging media. The university offers online programs on the graduate level as well, including a Master of Business Administration (MBA) program and Master of Science (MS) degrees in three areas - sustainable design, disaster medicine & management, and midwifery completion. Students accepted to the MS in Disaster Medicine and Management program are automatically considered for the Dean's Scholarship. Award amounts are based on the recipient's cumulative undergraduate GPA as well as specific program criteria. The MS in Midwifery program offers the following areas of specialization: teaching, advanced clinical practice, administration, international health, and research. Philadelphia University is reducing its current annual tuition by $9,000 for online students enrolled in undergraduate or graduate degree programs. Point Park University offers online Bachelor of Arts (BA) degrees in mass communication, organizational leadership, and public relations and advertising. There are currently five Bachelor of Science (BS) programs available online. These are: BS in Accounting, BS in Business Management, BS in Criminal Justice, BS in Information Technology, and BS in Public Administration. Courses for both the BA and BS programs are eight weeks in length. Students pursuing the BS in Public Administration degree can select either the EMS administration concentration or the fire service administration concentration. There is also a post-baccalaureate BS in Accounting degree offered online for individuals with an undergraduate degree in a non-accounting field. The university currently offers only one certificate program online, which is the Pennsylvania School Principal K-12 Certificate. On the graduate level, Master of Arts (MA) degrees are available in the following fields: adult learning & training, communication technology, curriculum and instruction, educational administration, and intelligence & global security. The MA in Curriculum and Instruction offers a concentration in teaching and leadership and can also be earned with Supervisor Certification. A Master of Business Administration (MBA) degree and a Master of Science in Health Care Administration and Management complete the university's current online offerings. The College of Engineering and Business at Gannon University offers two online degrees on the graduate level - Master of Business Administration (MBA) and Master of Public Administration (MPA). Students accepted to the MBA program can choose one of the following areas of specialization: finance, human resource management, and marketing. MPA students have two areas of specialization to choose from - administrative and organizational leadership. The university's College of Humanities, Education and Social Sciences also offers online degrees. At the current time, two master's degrees are available online - Master of Science in Criminalistics and Master of Education (MEd). MEd students can specialize in either curriculum & instruction or in reading. The MEd in Curriculum & Instruction is comprised of 30 credits and be completed in four semesters. Students who complete the MEd in Reading program have the option of obtaining a Reading Specialist Certificate, which is also available online from the university. There are currently two online degrees available at Morosky College of Health Professions and Sciences: RN to BSN and Doctor of Nursing Practice (DNP). The number of credits needed to complete the DNP program (26 to 32) depends on the number of clinical hours carried over from a student's MSN degree. The online Bachelor of Science (BS) in Health Sciences degree available at the Pennsylvania College of Health Sciences is designed for health care professionals with an associate degree or academic certificate in health sciences. Although the program offers hybrid and on-campus options, it can be pursued completely online. There are two areas of concentration currently available - clinical management and advanced practice/science. The BS in Healthcare Administration degree can also be pursued entirely online. The required courses for the program are available asynchronously. Additionally, the Pennsylvania College of Health Sciences offers an RN-BSN programs that can be completed online in just two years. At the current time, there is one graduate-level program available, which is the Master of Science in Nursing Education. The program is comprised of 33 credits and can be completed in two years. Students accepted to the program will be required to attend two integrating experiences on campus, which are conducted in two weekend sessions. The online Professional Certificate in Cardiac Electrophysiology is a 16-credit program designed for technologists working in an electrophysiology or cardiovascular lab. Students who graduate from the program will be eligible to sit for the Registered Cardiac Electrophysiology Specialist exam from the Cardiovascular Credentialing International (CCI). Mansfield University has seven degree programs that students can complete in an online environment. Options include an Associate of Science in Computer Information Systems or in Criminal Justice Administration, a Bachelor of Arts in Art History or Liberal Studies, a Bachelor of Science in Nursing degree-completion program for practicing RNs, and master's degrees in nursing and nutrition. The Master of Science in Nutrition is a 100 percent online program open to students who earned a bachelor's in nutrition with a GPA of 3.0 or higher. Applicants with a degree in a different subject must take up to eight prerequisite courses before beginning the graduate program. The Master of Science in Nursing program requires 33 credits, and students can choose a nurse educator concentration or a nurse leader/administrator concentration. RNs working toward their BSN take all their coursework online, and the courses are on a three-year rotation. The online Associate of Science in Criminal Justice program, introduced in 2013, is specifically designed for students who need to arrange classes around their work schedule, such as members of the military or students who work in criminal justice. Neumann University offers three degree programs for adult learners that can be pursued 100 percent online: Bachelor of Science (BS) in Public Safety Administration, Master of Science (MS) in Organizational and Strategic Leadership, and MS in Education. Students pursuing the BS in Public Safety Administration degree can transfer up to 90 credits into this 120-credit program. These transfer credits may be comprised of college or university units, military credit, or prior learning, which must be officially documented. The program has three starting points each year (fall, spring, and summer), so students can begin their studies at a time that is most convenient for them. Tuition for this program is offered at a 20 percent discount from the university's regular per credit-hour tuition. The MS in Organizational and Strategic Leadership degree is a 30-credit program, consisting of 10 three-credit courses that are each eight weeks long. Students typically complete the program in 18 months. The MS in Education degree is an accelerated program that can be completed in just one year. Certified teachers enrolling in the program have the option of receiving an autism endorsement. Non-certified students can receive a certificate of completion for any autism endorsement courses they take. Millersville University of Pennsylvania offers one online bachelor's degree program, two online master's degree programs and three online graduate certificates. The school's online bachelor's program is a RN to BSN program, which is a degree completion program for registered nurses looking to earn a bachelor's degree. Master's degrees are available in emergency management and special education, while graduate certificates are available in gifted education, nurse educator studies and coaching education. The school also offers two online certifications for educators: a STEM teaching endorsement and an online instruction endorsement. The College of Lifelong Learning at Immaculata University offers nine undergraduate degree completion programs online. Many of the programs have generous transfer policies that allow students to apply up to 72 credits towards the bachelor degree of their choice. These credits can come from courses completed at accredited institutions or from prior learning such as military training or education, as well as technical and professional programs. The Bachelor of Science (BS) in Emergency Planning and Management is the only degree-completion program in the region offering a major in the emergency planning and management field. The program is recognized by FEMA (Federal Emergency Management Agency). Courses for this degree follow a hybrid method of delivery. Students who start the program with a minimum of 64 transferrable credits can expect to earn the degree in two years or less if they enroll in classes throughout the year. Immaculata's online RN to BSN program is CCNE-accredited and follows a cohort model of education. Additional online BS degrees are available in the following areas: cybersecurity, healthcare management, organizational behavior, marketing management, human resource management, finance, and business management. An Associate of Science degree in business administration complete Immaculata University's current online offerings. Bloomsburg University of Pennsylvania offers an online program leading to a Master of Science in Instructional Technology with a corporate track and an instructional technology specialist track. The corporate track is aimed at people who want a career in training for organizations such as business, industry, nonprofit agencies, or government agencies, and the curriculum focuses on interactive multimedia. Bloomsburg says the corporate track has a placement rate that exceeds 90 percent. The instructional technology specialist track can lead to certification as an instructional technology specialist for teachers licensed in Pennsylvania. Candidates are required to take 11 courses, and the material in most courses has both synchronous and asynchronous elements. Applicants must have a bachelor's degree with a GPA of at least 2.8. Bloomsburg also offers a completely online program leading to an eLearning Developer Certificate for professionals who work in a school or professional training environment and want to use interactive online technologies as a teaching tool. To earn the certificate, students must earn 12 credits and they have the option of taking two electives to gain additional skills. Credits earned for the certificate can be transferred to the master's program. La Roche College offers three bachelor's degree completion programs and one undergraduate certificate that can be completed entirely online. These programs include the Bachelor of Science in Leadership & Administrative Development (LEAD), the Bachelor of Arts in Medical Imaging, the RN to BSN Online Degree Program, the Accelerated Criminal Justice Degree Completion Program and the Undergraduate Certificate in Administration. La Roche offers two online graduate programs as well: the MSN in Nursing Administration and the MSN in Nursing Education. La Roche also offers over 75 individual online courses in fields like administration and management, aesthetics, computer science, economics, English, finance, history, information technology, literature, marketing, philosophy, religion, sociology and technical writing. Shippensburg University's Department of Professional, Continuing and Distance Education offers online degrees and certificates in the fields of business, management, and education. The online MBA is delivered 100 percent online and uses the same faculty that teaches the on-campus MBA program. Courses include both synchronous and asynchronous elements, but any activity that requires students to be online at a set time is optional. Courses are delivered in an accelerated, eight-week format, and students take one course at a time. Online business students can also earn graduate certificates in finance, health care management, management information systems, supply chain and logistics management, advanced studies in business, or online learning, instruction and technology. Career changers who want to become teachers can earn a Master of Arts in Teaching STEM Education in a blended format that includes online classes and face-to-face meetings one Saturday a month in Harrisburg, Pennsylvania. Other education programs offered online include the Pennsylvania early childhood director credential and the literacy studies graduate certificate. The Quaker State is home to some of the best distance learning options in the world, so it can be easy to get overwhelmed while researching them. That’s why we assembled this guide to online colleges in Pennsylvania. We’ll link you to online degree and course catalogs, point out some initiatives you might otherwise overlook, and let you know which programs are best-priced for your residency situation. We also profile the state’s most affordable online colleges and fill you in on schools with subpar records from their accreditors. You want an online degree from Pennsylvania. Reading this guide is the first step to getting one. Pennsylvania’s State System of Higher Education (PASSHE) is composed of 14 four-year universities (essentially any school ending with “University of Pennsylvania” except, confusingly, the University of Pennsylvania itself). To find all of PASSHE’s online programs, visit its What Should I Study? page. Under “additional options,” select “show only online programs.” The downside is you can’t just see all the programs, so you have to enter something in the “I’m looking for” field. Click on the computer icon to see if it’s a blended or fully online program. 20% of the 66 members in the Online Consortium of Independent Colleges & Universities (OCICU) are Pennsylvania colleges and universities. Enrolling at an OCICU school gives you access to online courses from other members in the Consortium. To get a general sense of the 1,000+ classes on offer, browse the course catalog. However, the college at which you enroll might just accept a few of those courses, so select your home institution to see what your specific options are, then narrow down the selection by program and degree level. Pennsylvania’s OCICU members are Alvernia University, Carlow University, Cedar Crest College, Chatham University, Chestnut Hill College, Gannon University, Gwynedd Mercy University, Holy Family University, Marywood University, Mercyhurst University, Neumann University, Robert Morris University and Seton Hill University. You may not realize it, but most online schools don’t accept students from certain states. The National Council for State Authorization Reciprocity Agreements (NC-SARA) makes it easier for most students to attend online programs across state lines, but only at member schools. These schools include a couple on our list of the state’s most affordable online colleges: Indiana University of Pennsylvania and Slippery Rock University of Pennsylvania. Regardless of the school’s SARA status, if you’re coming from out of state, check whether you can enroll in an online program there. Plenty of students take advantage of cheaper community college tuition before transferring to a four-year college to finish up. It’s particularly easy if you choose schools that participate in the Pennsylvania Transfer and Articulation Center (PA TRAC). Some of these schools, such as Harrisburg Area Community College, have fully online transfer degrees. Of course, not every four-year school offers all possible academic programs, so use the transfer agreements search tool to learn where to go after earning a transfer degree. Multiple Pennsylvania universities have been featured in the top 25 of one of U.S. News & World Report’s rankings of best online colleges, representing every category from graduate nursing to bachelor’s degrees. But Pennsylvania universities dominated one list in particular — Best Online MBA Programs — with a trio of Quaker State universities landing near the top: Carnegie Mellon, Penn State and Lehigh. Speaking of U.S. News & World online rankings, one Pennsylvania school keeps showing up: Penn State-World Campus. This over-achiever regularly lands in the top 10 rankings of best online bachelor’s, MBA, graduate business, graduate education, graduate engineering and graduate IT programs. 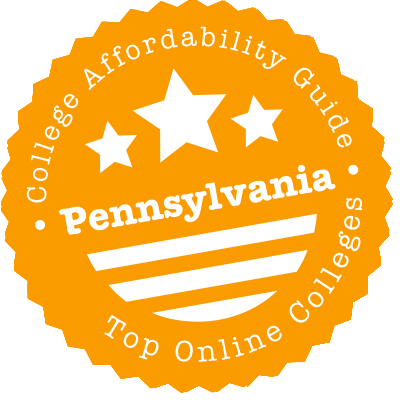 Plenty of Pennsylvania colleges met our criteria for both quality and affordability. Look at College Scorecard to see how these colleges compare to the hundreds of other options in the state. Distance education at Bloomsburg University is restricted to one master’s program and one graduate-level certificate, unless you don’t care about college credit. Then, you have a full catalog of noncredit courses designed to enhance your career, often by qualifying you for professional certifications. Contact Bloomsburg to register for a class. For such programs, financial assistance is limited to loans and some government grants for workforce development. But if you’re getting credit, talk to the Financial Aid Office about your scholarship, grant and loan package. By attending Clarion Online, nonresidents get a sizable discount over their counterparts at the Clarion, Venango and Pittsburgh campuses, and end up paying only a bit more than Pennsylvanians. (State residents pay the same tuition, no matter the campus.) Regardless of your residency status, let financial aid work for you. Clarion runs dozens of online programs, covering every academic level, and several graduate degrees (plus the RN to BSN) offer accelerated seven-week course formats in addition to standard classes. If you’re a sophomore, junior or senior in high school, consider dual enrollment at Clarion. You can enroll in one course per semester at a much cheaper rate. Indeed, high school may be your last chance to get college credit so inexpensively. IUP runs online and hybrid programs at the undergraduate and graduate levels, in addition to a slate of online courses. The Office of the Bursar explains IUP’s tuition and fees. But the Office of Financial Aid helps you navigate an affordable path to payment. You don’t have to register for credit-based courses; the Office of Extended Studies partners with two online providers of non-credit professional development, career training and language programs. They’re not eligible for financial aid, but you may be able to score a company discount if your colleagues register with you. Mansfield Online doesn’t do full degrees, but it does conduct individual online classes, which cost less than on-campus courses (at the undergraduate level only). Summer courses come with a modest tuition discount and are eligible for financial aid, but most of their value comes from minimizing the amount of time you’re not gainfully employed. Millersville’s fully online programs are mostly at the graduate level, but it also makes online and blended courses available to all students. Enrolling in summer sessions can speed up your graduation date. Also, summer tuition is cheaper than spring and fall tuition. Don’t worry: You can qualify for summer financial aid. On the course search catalog, scroll to “Search by Distance Learning” to see your options. Slippery Rock places several undergraduate and graduate programs online. Nonresidents are charged only slightly more than their Pennsylvanian colleagues but can get a Slippery Rock degree for much less than even residents pursuing studies on-campus. Everyone can reduce that further by enrolling in online summer courses. Read the Tuition and Fees page for details. While you’re at it, read up on your financial aid options. Accreditation. You’ve probably heard the word, but what does it mean? Roughly, it means an independent body has reviewed a college and its academic offerings and judged them to meet basic standards of quality. Run from any school not accredited by an organization recognized by the U.S. Department of Education. National accreditation is acceptable, but regional accreditation is best because credits from regionally accredited schools are more likely to transfer. The Middle States Commission on Higher Education (MSCHE) is the regional accrediting body for colleges and universities in Pennsylvania and other states along the Atlantic seaboard. Access the Institution Directory to search for higher education institutions in the Quaker State. If you’re using the directory to discover colleges, feel free to filter by control (public or private) and highest degree level offered. The Council for Higher Education Accreditation (CHEA) database is also useful because it lists both regional and national accreditations. If it’s not on the CHEA database, it’s not accredited. The Art Institute’s parent company, Education Management Corporation, has been plagued with major financial struggles, prompting it to shutter sister campuses, including the Art Institute of York. MSCHE placed Butler County Community College, which offers online and hybrid courses, on warning in 2016. The accreditor is asking for “direct evidence of student achievement of general education learning outcomes.” Butler County remains accredited while on warning and must submit a monitoring report in 2017. MSCHE placed Cheyney University, which runs an online/evening MPA program, on probation in 2015. During 2016, the school took steps to address the accreditor’s concerns, but remained on probation at the end of the year due to issues related to budgeting, fundraising and debt repayment plans. Indeed, the Department of Education is also concerned about the university’s solvency. It has placed Cheyney on Heightened Cash Monitoring 2 (HCM2) due to concerns about the institution’s ability to manage federal financial aid dollars. While on HCM2 the school has to pay for financial aid out of pocket before being reimbursed by the federal government, which can drain its accounts. So much about Georgian International University of America is unclear, such as the extent of its online offerings. What is clear, however, is that it’s not accredited. Therefore, it doesn’t appear in the CHEA database or on College Scorecard. Middle States Commission on Higher Education (MSCHE): Middle States is the regional accreditor for Pennsylvania’s two- and four-year degree granting institutions. Explore its website to learn of any recent disciplinary actions it’s taken against a school. Pennsylvania Department of Education: K-12 students interested in distance learning at the primary and secondary school levels can find explanations of the state’s cyber charter schools along with a directory of the 14 free public institutions. Pennsylvania Transfer and Articulation Center (PA TRAC): If a credit transfer is in your future, use PA TRAC to see how the credits you’ve earned will be applied at a Pennsylvania four-year college. Discover, as well, which schools have built-in transfer agreements that can allow you to migrate a whole two-year degree over to a baccalaureate program. Online Consortium of Independent Colleges & Universities (OCICU): If you’re headed to a Pennsylvania member of OCICU, you’ll have access to distance education courses from other private colleges. Select your chosen school on the search tool to see which ones. Pennsylvania’s State System of Higher Education (PASSHE): Use PASSHE’s search tool to see which schools have your desired program in an online or hybrid format.